Overlooking the pool and the ocean this property is perfect for a tropical vacation. White sandy beach with a tiki hut gives you an opportunity to enjoy the outdoors. The condominium includes a screened porch that allows for outdoor dining while enjoying the sounds of the ocean. The furnishings are first rate. Play tennis on the property, play golf nearby at the Key Colony Par 3, fish from many of the charter boats, dive, snorkel, shop, dine, or just kick back and enjoy. Phone is for emergency use only. This was one of the best vacations we ever had. Royal Plum feels like a remote, private resort and yet is so convenient to everything in and around Marathon. The condo was absolutely perfect. It is so nicely outfitted with everything from kitchen utensils to plentiful sheets and towels. And then there's the view. With the ocean and pool views right out of our balcony we felt like we were on a cruise ship! The pool is sparkling and that's no surprise since Kevin was out cleaning it bright and early every day. He and Meghan could not have been more welcoming and helpful. The guests and residents were super friendly. We were sad that we didn't get in on happy hour until our last night. We will be back! Thank you so much! We love Coco Plum, too! Please don't hesitate to contact me in the future to visit again. You were great houseguests! Beautiful ocean view condo! Great view of pool! 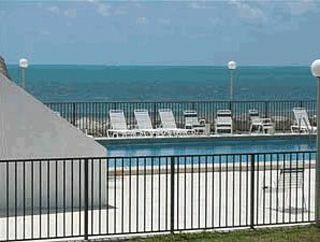 The condo is a very spacious one bedroom and one bath.you can watch older children swim in the pool from the balcony. The kitchen is fully functional. The condo isn’t luxurious but very homey and beachy. It’s the perfect place to unwind. Also while we were there my son lost his wallet. The owner emailed me to see if we lost it based on the id. Then they went to the extra trouble to ship it to us! So these are truly honest and wonderful people (the owner, management, and housekeeper). The manager is on site and gives you all is phone numbers Incase you have any problems or questions. He is super nice and friendly. Marathon was still under a lot of construction which I was surprised by but I guess with it just being one year since Irma I shouldn’t have been. Also extra work do to the tropical storm that hit the week before we arrived. Both of which was out of everyone’s control. We still had a great time. If you are planning a trip this is a wonderful condo to stay in! God bless! Thank you for your kind review! We really like the condo, too! Sorry that The Keys are still a little torn up, but, we've seen exceptional progress in a year. Our little place was spared but many of our neighbors weren't as fortunate. We hope to see you again real soon! Take care! Condo was very large for a one bedroom. Pool and beach were beautiful . The view was beautiful. The unit was clean. We had plenty of space. There were a few things we needed that were not provided (muffin pan, cast iron skillet). We loved our time in the Keys!!! We stayed here during July 4th week. It was quiet other than you could hear your neighbors talking and coming/going due to thin walls. No rowdy people though. I really enjoyed the pool and the scenic location. It was also a great area for me to take my daily morning runs. It's efficiently managed as well by two people on site. Thanks for reviewing my condo for VRBO. I hope you enjoyed the 4th! We hope to see you again soon! Royal Plum as lovely as ever. This was our fifth wonderful stay in the condo, and it is truly amazing how Royal Plum responded after Irma. Our host was great and the property manager as friendly as ever. The condo had fresh upgrades and was very comfortable. Outside, the pool was very clean and inviting, the beach was freshly raked and I would never know that Irma had any impact - except I saw the photos! Royal Plum is still my favorite vacation location. Thanks for your kind review! We've been truly blessed to have great support from our loyal staff, Kevin and Meghan. I'll share your praise of their hard work. Local code requires a one week stay, and the normal routine on this is Saturday evening to Saturday morning of the following week. A $200 deposit holds the unit with balance due two weeks prior to stay. Prices are subject to alteration without prior notice and with no guarantee until deposit is received. Check or money order only. NO PETS ALLOWED. There is no smoking allowed inside the unit, but there is availability outside.